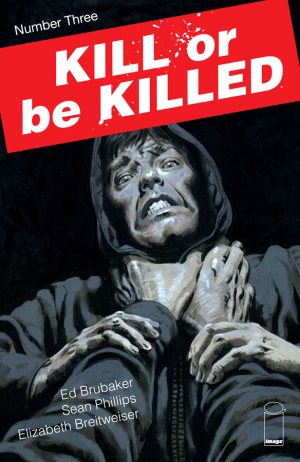 In issue three of Kill or be Killed, Dylan is dealing with the consequences of his actions (and inactions) we saw last time. Can he live with himself? Can he settle things with Kira? Let’s dig in! So… yeah, lot’s to unpack this issue. Dylan is overwhelmed with guilt after his first kill… and then he finds out that his victim was an awful human who associated with other awful humans who, as a result of his murder, were all brought to justice. That’s nothing to say of what we learn about Kira’s childhood. Yeesh! And just when it seems like Dylan is going to get over the hump (literally?) and deal with his and Kira’s issues… a roadblock. I’ve read some criticisms that attack this new series on the grounds that Brubaker has done this sort of story before and he’s done it better. My feeling is that such an argument is fundamentally flawed. Fatale (I presume reviewers are referring to Fatale when they say “he’s done it before and he’s done it better”) was an epic drama populated with tons of characters, locations and time periods while Kill or be Killed is an intimate character study about one man’s reactions to his ever changing life – I suppose they are both noir and both have a demon(s), but that’s where the similarities end. Criminal, Vol. 6: The Last of the Innocent. And by that diatribe I mean that Kill or be Killed continues to impress me with its storytelling, art, colors… the whole shebang. I’m not even going to bother assigning a rating to this book and instead, I’ll just say that this book gets my wholehearted recommendation – go get it!